For more than a decade now, the site has received an email per week (estimated) from site visitors asking the same (or similar) question: "What is that small tripod pictured in your [relevant camera or lens] review?". I know, with (probably) well over 500 people having asked already, the answer to that question is long overdue. What tripod is that? It is the Really Right Stuff TP-243 Ground Level Tripod. What has been the driving force for this question being asked? The tripod is pictured in practically every lens review on this site. Still, simply being featured in product images is not enough to drive inquiries. The big reason is how awesome the Really Right Stuff TP-243 Ground Level Tripod looks, which is one of the primary reasons I use it in product photos. And of course, the potential usefulness derived from those good looks is the other big factor driving interest. To begin the review, let's look at the the tripod's specifications to put its ideal uses into context. The RRS TP-243 is extremely-solidly constructed of CNC machined 6061T anodized aluminum and stainless steel. I didn't remember the weight capacity rating when beginning this review and expected to see a number to be two or three times higher than the seemingly-conservative 50 lb rating. Regardless, there are going to be very few applications requiring even half of that weight on the TP-243. 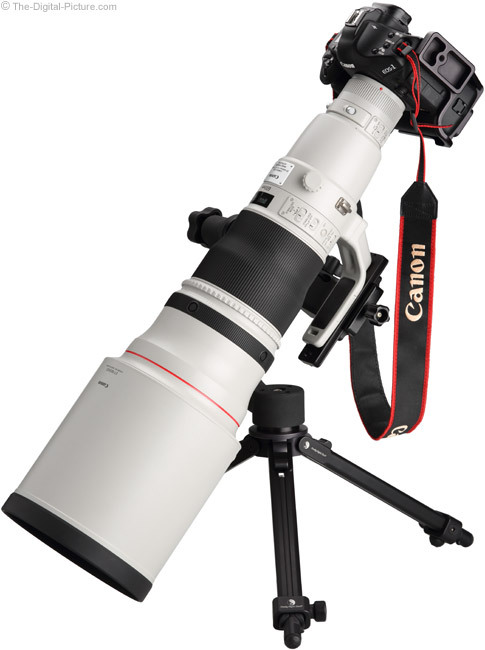 Though it is not heavy, the heavy-duty construction brings with it a weight that is well-above many other mini tripods. The RRS TP-243's one-piece chassis and top plate measures 2.67" (68mm) in diameter and is 1.36" (34mm) thick. These are maximum measurements with CNC machining removing un-needed material for a very robust final design. The image above shows the bottom of the chassis. 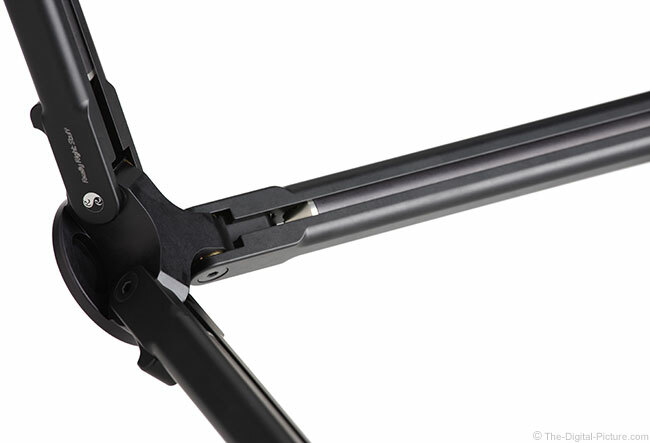 The tripod legs can be independently locked into one of three angles using the spring-loaded angle selection slide levers and pivots anchored by tension-adjustable black zinc plated stainless steel bolts. The fourth angle is folded straight down where the legs are stopped just short of touching each other at the rubber feet on the sides of the legs. As seen below, fully opened TP-243 legs are positioned straight outward, permitting a very low, ground-level shooting position. 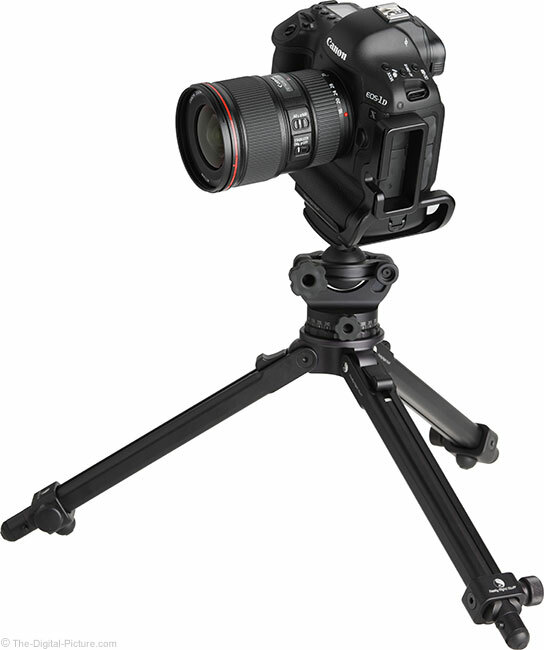 From an engineering perspective, fully opened/splayed legs provide the tripod's weakest position. However, in this position, a significant amount of down pressure is required to create even a small amount of flex. When fully opened, rubber feet located on the sides of the legs hold the tripod off of the ground when on a flat surface. The fully opened position is likely where the seemingly-conservative weight rating was derived (the minimum factor concept), because in the mid-height position (shown above), this little tripod shows essentially no flex even when supporting my entire 170 lb (77 kg) body weight. The rubber feet compress modestly (completely expected), but ... the little tripod seems to support the weight without effort. Quite impressive. 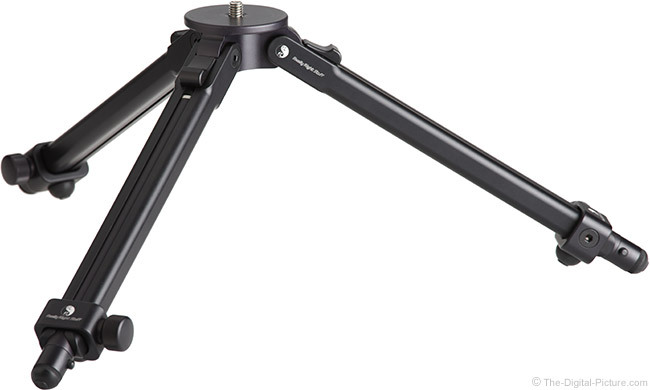 This is a 2-leg-section tripod. The two-piece top leg section anchored by a bolt/axle at the top and is surrounded at the bottom by a reassuringly-robust thumbscrew-locking clamp that holds the second section at the desired extension. The bottom leg section is easily removable and is reversible, allowing immediate switching from the stainless steel spiked feet to the rubber feet, maximizing the tripod's grip on a variety of surface types and offering protection to those that need it (like the dining room table). When the spiked feet are in use, a push-button release prevents the leg section from inadvertently dropping out when the thumbscrew is loosened. The simplicity of the TP-243's design combined with easy disassembly means that field cleaning this tripod is quite simple. The height range of this tripod will be one of the primary selection considerations. The 1.9" (4.8cm) minimum height is practically as low as possible and the 17.7" (45.0cm) maximum height is useful, but not terribly high. When considering the height range, keep in mind that most photographers will use a tripod head (vs. affixing the camera directly to the 3/8"-16 tripod screw) and the tripod head's height must be considered when estimating the actual camera height. About as big as camera setups get: above is the Canon EF 600mm f/4L IS II USM Lens mounted to a Canon EOS-1D X Mark II and with a Wimberley Gimbal Head under it. The Wimberley head is an excellent choice for mounting larger lenses to any tripod and it works very well even with smaller lenses with tripod rings. The TP-243's ability to position the camera low to the ground makes it ideal for photographing ground level birds (especially waterfowl), small-to-medium-sized animals (chipmunks, squirrels, foxes, beavers, otters, ferrets, etc.) and perhaps even small children. A low camera position is often desirable and usually aids in maximizing the background blur, making a subject dramatically stand out from its background. Getting low also makes subjects appear more imposing compared to the same subject being photographed from a higher perspective. Sporting events are another venue where cameras are frequently positioned on the ground (often triggered by remote control) and this tripod is perfect for that use. Macro photographers will find this tripod well suited for capturing ground-based insects and plants, with the tripod's rigidity aiding in long duration captures including timelapse sequences. 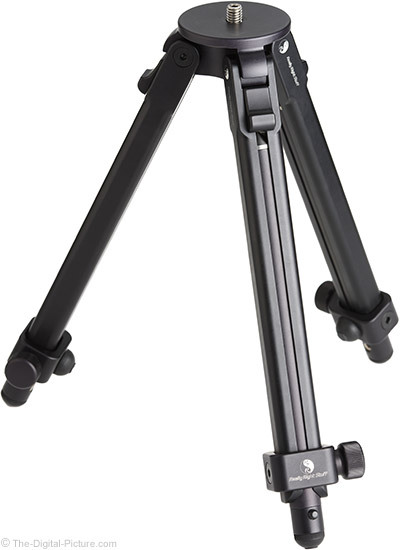 There are a huge range of ground-based surfaces this tripod can be used on, but the TP-243 is also very useful on any table, rock, wall or similar elevated surface, including in the studio, in the kitchen, in the city and in the field. Note that, when used on the ground, even at maximum height, a camera mounted to this tripod is not comfortable to use from an up-right sitting position (at least not for someone 6'/1.8m tall). Laying flat on the ground works very well, a bent over sitting position can work and a Canon Angle Finder C (or similar) or a tilting/vari-angle LCD can make life easier for other body positions. 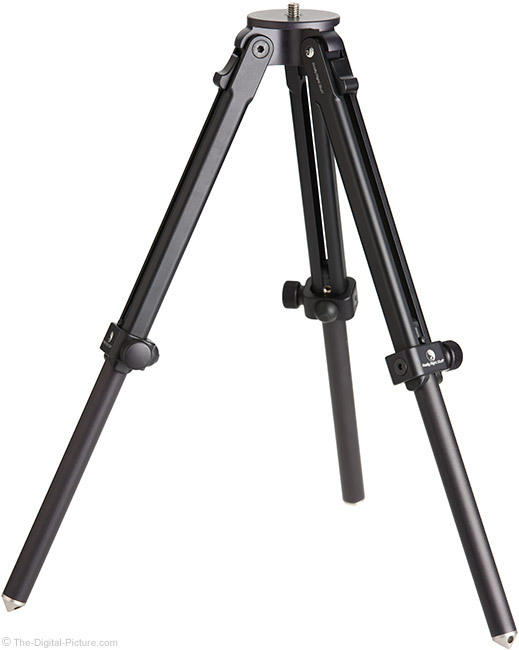 High quality often does not come cheap and the price of this tripod reflects that wisdom. However, you probably will never need to buy another similar tripod and buying quality once is very often a better deal than buying a lesser product and then a better one(s) later. Really Right Stuff backs the TP-243 Ground Level Tripod with a 5-year warranty and some of the best customer service in the industry. The reviewed tripod was retail-purchased and has been in my kit for well-over a decade. 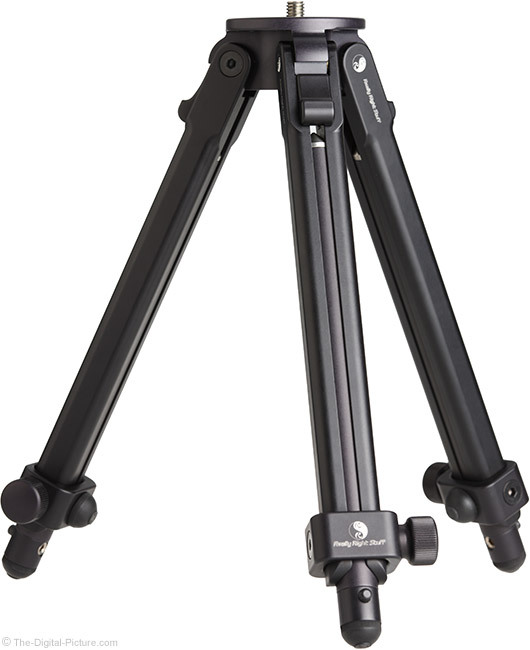 The RRS TP-243 Ground Level Tripod is an extremely sturdy, extremely-high-quality-constructed tripod that will easily support any DSLR camera and lens made. It features a great-yet-simple design along with attention-garnering looks – looks good enough to generate a steady stream of email from site visitors interested in learning what model it is.